This Story Map is part of a lesson plan developed for Grade 9 Issues in Canadian Geography in the Department of Geography and Environmental Studies at Ryerson University. 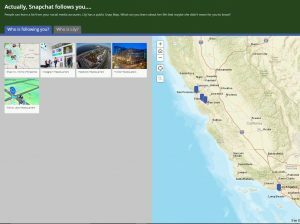 This screen shot is the introduction of Snap Maps and background on Snap Inc.
Story Map is a template for publishing text, interactive maps, and other media as a package. It is provided by ESRI and is only available on ArcGIS Online. You can apply for limited ArcGIS Online account for free, or, if you are apart of a larger organisation that can afford it, a full account at a cost. This lesson is intended to teach students about how major social media platforms (specifically Snapchat) can geo-code their uploaded photos allowing others to follow the student’s location and learn details about a student’s life that maybe they didn’t indent the viewer to know. This style of Story Map is called “Short List.” As you can see, it shows places of interest organized into a set of tabs. It would be particularly useful for travel diaries or trip guides. It is very easy to create. 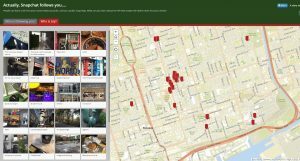 Just upload the pictures you want to use and either type in an address that you want them associated with, or click and drag the marker to the appropriate location on the map. A description can be added to every picture. Viewers can either select the picture under the tab they are interested in and its marker will be highlighted, or select the marker and the picture will be highlighted. 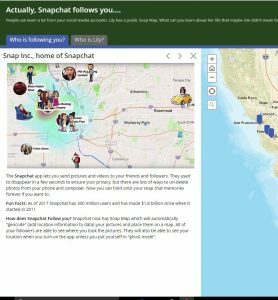 The first tab is a warm up section providing basic information on Snapchat, Instagram, Facebook, Twitter, and Niantic (Pokemon Go) and it allows the students to make some spacial observations about the locations of these companies headquarters. This screenshot is of the first tab where students learn about different social media platforms that make use of geo-coding. The second tab shows a Snapmap-like account for a fake student named, Lily. Using the worksheets provided with the lesson plan, students piece together details about Lily’s life and whereabouts, and reflect on what they are telling people with their own social media accounts. 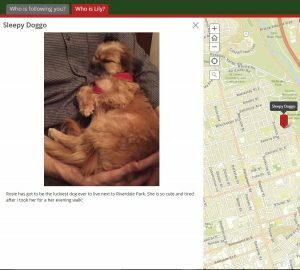 Locations in Toronto that Lily has Snap-mapped and unintentionally given valuable information about herself. This picture indirectly tells people where Lily lives and where you can find her almost every evening. Check out my Story Map here! However, this blog is missing an important component of this project, the lesson plan. It is really only applicable for teachers, but I will include some of the questions that that students would be required to answer while investigating these maps. You (and the students) may feel uncomfortable at the idea of asking some of these questions about Lily’s life, but it is be a good opportunity for a teachable moment discussion. Many people hearing about this lesson plan felt it was important, but ‘creepy”. Here we want to encourage students to express their feelings and reflect on the idea that people could be doing the same thing to them through their social media accounts. This type of spatial analysis can be used for unsavory goals and it’s important that this reality be acknowledged. 1. What school does Lily go to? 2. How do you think Lily gets to school each day? 3. What year is she in? 4.What programme is she in? 5. Name two of Lily’s friends. Do they go to same school as her? 6. Where does Lily live? 7. Do you think Lily has a lot of money? Why or why not? Bonus: What bank does she use? I hope this post gave you some helpful and interesting ideas. Thanks for reading!